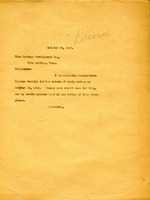 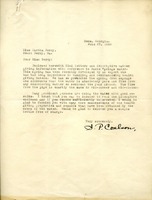 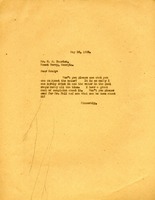 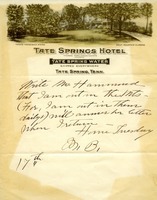 Berry instructs that a letter be sent to Mrs. Hammond that she is out in the mountains and will answer her letter when she returns. 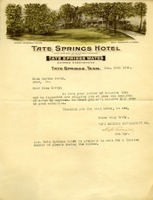 On Tate Springs Hotel stationery. 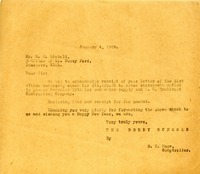 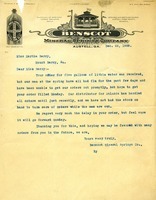 Letter to Miss Martha Berry from Benscot Mineral Springs Co.
Benscot Mineral Springs notes that they have received Berry's order for lithia water but have been delayed in filling it due to men having the flu. 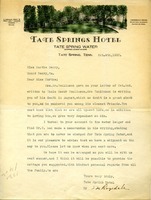 Letter sending receipt for empty carboy, requesting credit memo for same, and requesting one carboy of Tate water be sent by return express. 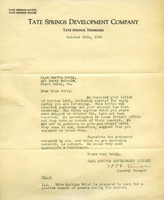 The General Manager states that only one of the three carboy bottles being returned to Tate Springs has been received, therefore the statement that Martha Berry had written about is correct and should be paid.